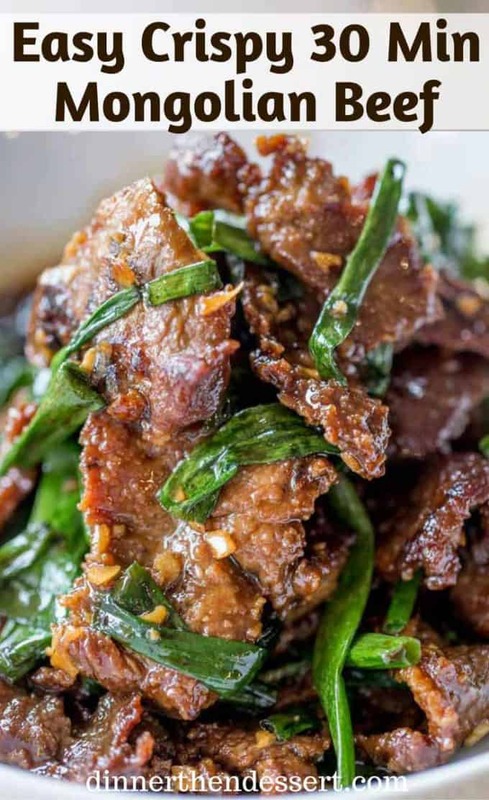 Mongolian Beef is a recipe that I’ve been cooking for clients for many years for a number of reasons. One, people love anything that tastes like Chinese takeout. 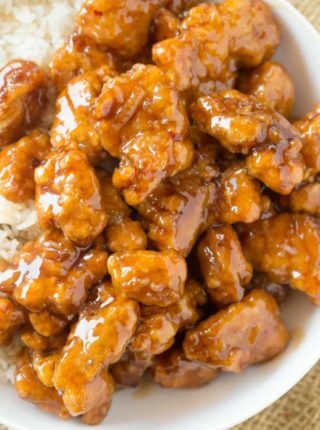 Two, the sweet flavor of the dark brown sugar mixed with the salty soy sauce and the strong ginger and garlic is incredibly addicting and three you get to enjoy it over a mountain of steamed rice, which if you are anything like me is your happy place. 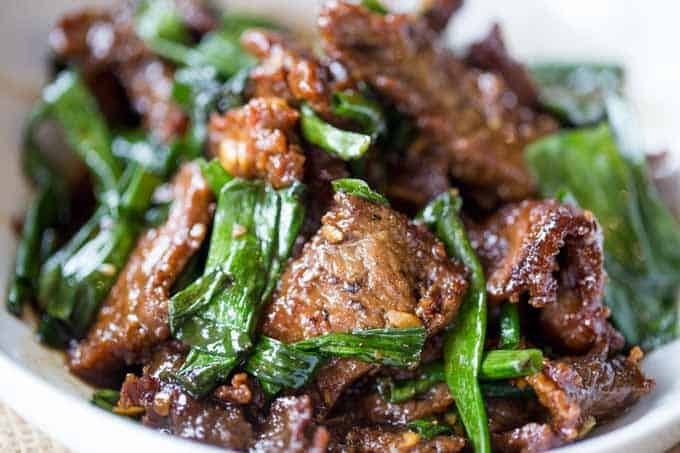 This Mongolian Beef is very flavorful and takes just 30 minutes to make from start to finish including all the slicing of the meat! It also uses basic pantry ingredients so don’t worry I am not sending you to the store today for oyster sauce or hoisin sauce. Everything in this recipe is available in every grocery store. SO many more Chinese Food options! The one thing I want to caution when preparing this dish is how thick you slice the steak. If you feel uncomfortable with cutting the steak thinly enough and have an hour or so notice, place the steak in the freezer for one hour. This will freeze it just enough that slicing it will be as easy as slicing a vegetable. The meat will firm up enough that you can slice it even thinner if you’d like. 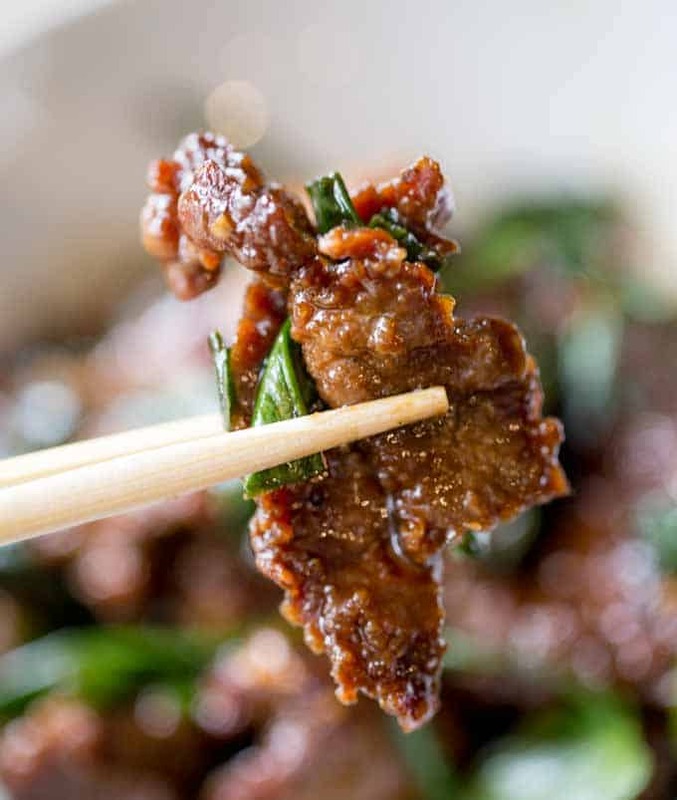 Mongolian Beef that's easy to make in just 30 minutes, crispy, sweet and full of garlic and ginger flavors you love from your favorite Chinese restaurant. If you need to cook the steak in batches because your pan isn't big enough do that rather than crowding the pan, you want to get a good sear on the steak and if you crowd the pan your steak with steam instead of sear. The cornstarch we used on the steak should thicken the sauce, if you find it isn't thickening enough add 1 tablespoon of cornstarch to 1 tablespoon of cold water and stir to dissolve the cornstarch and add it to the pan. It was delicious. I added a bit of sherry, a pinch of crushed red pepper to the oil plus regular sliced yellow onion. I served it with vegetable fried rice but would have been even better served over fried rice noodles! Thank you for such a simple but great recipe. Excellent Recipe!! Made just as written except adding frozen string beans as one reviewer wrote. Will make again and again!! I made this tonight used peanut oil which added to the flavour but was to sweet will have cut back next time also would prefer noodles instead of rice but still very nice thank you for sharing your recipe. I forgot to rate with stars before. This was excellent!! This was just like in a restaurant and so easy to make. It’s quick enough to do on a weeknight as well. Family LOVED it. I feel like a gourmet cook. Thanks for the recipe. So glad you decided to give it a try! Thanks for the 5 stars. Mmmmmm good – better than the restaurants! Next time I need to make more – it went so fast! Thanks for the recipe. Tasty dish, definitely on my repeat list, quick,easy and tasty. I did however substitute the spring onions, didn’t have any, with pre cooked french beans and olive oil rather than the canola oil again not available. Subs may have altered the taste but still delicious. I have an electric stove (no Wok). I’m wondering if I can get the pan hot enough to quickly cook the flank steak without a wok and gas heat. Any suggestions? I’m always uneasy about electric stoves because each one seems to heat so differently. I’d say if you’be been using yours for a while now and know it’s heating abilities, give it a shot. Good luck! 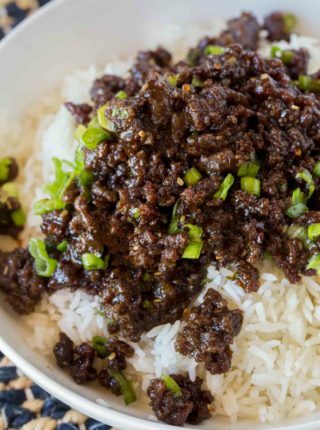 Easy, wonderful flavors, and plenty of sauce (so many recipes leave so little sauce for the rice or other starch). Family loved and we have saved this in our recipe folder. Also, added broccoli for additional veggies and was perfectly fine! 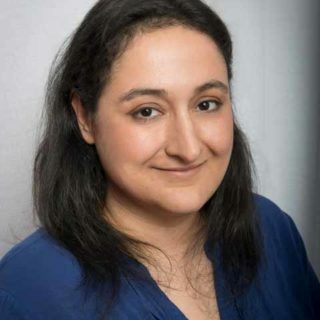 Thank you Sabrina! This was DELICIOUS! Accidentally cut my steak strips a bit wide, so just needed to do 90 seconds a side but otherwise perfect! So tasty, will be making this again. 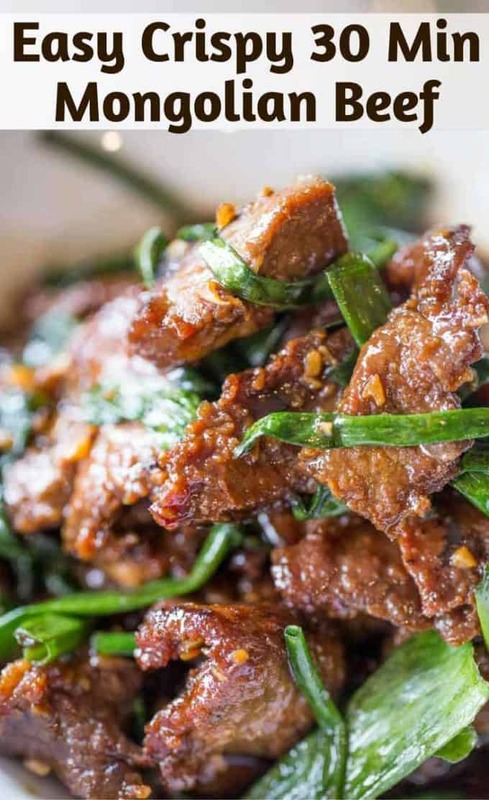 Soy fanático de la comida china y estoy seguro de que esta receta sera de mis preferidas. I made this for dinner and family loved it. It was a easy meal and the directions were easy to follow. Love making meals that are different and easy to make. Thank you. Super easy and super yummy! Will totally make again! Too much sugar. I will cut to 1/4 cup next time (from 1/2 cup) I also added 1/2 a green pepper,.1/2 a red pepper and 1/2 of a yellow pepper sliced, 2 carrots sliced thin and half a jalapeno. I liked it. But way too much dark brown sugar. I made this tonight and added broccoli to it with the scallions. Very good! Fantastic recipe! Easy to make. 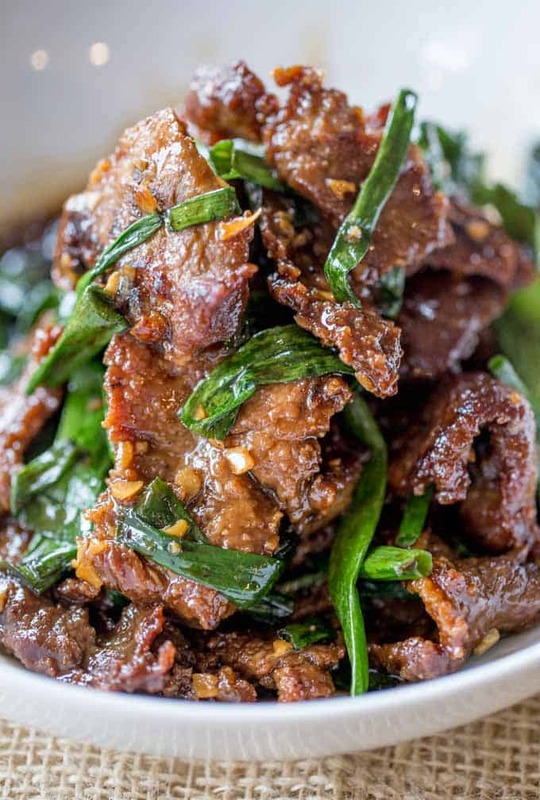 I really don’t cook much and I put off trying this because I thought it would be very complicated, beyond my limited kitchen skills but this was really straightforward and turned out as some of the best Mongolian Beef I have ever had! Family and friends say we may never eat this away from home again; begging me to make it more often. Great tip to freeze the meat for a bit before slicing. 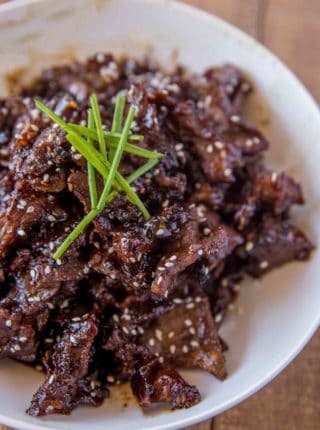 I would also be sure to use LOW-Sodium Soy and DARK brown sugar if you have them available (I used regular soy and lite brown the first time and it was still great however). I served with egg fried rice with onion and about one cup of frozen peas and carrots mixed into the rice. I believe I got 6-8 servings. Make some extra; the leftovers are as good if not better as the flavors meld together over a day or two! Thanks so much; feeling braver in the kitchen now! What a great meal doubled the recipe it was heavenly. Everyone enjoyed it. so delicious and fast made. This was outstanding! Finished with a heavy sprinkle of Black pepper. Absolutely gorgeous! Wish I had found this earlier. Added red peppers, a touch of sesame oil, onions and a handful of cashews. Perfect! A definite keeper. ? So glad you enjoyed it! Thank you for coming back and letting me know how it turned out. I love the idea of adding the cashews too! So easy and delicious, my husband is very basic in his foods, while I am adventurous for new foods. This satisfied us both, I added snow snap peas at end (cooked about 3 min) . 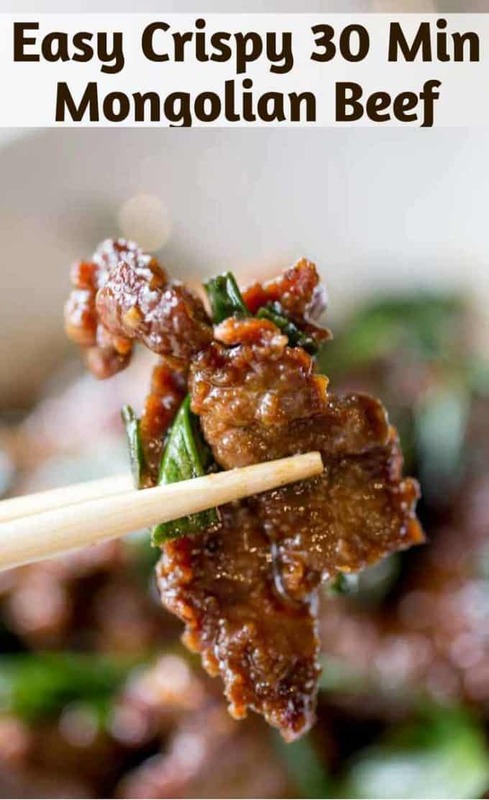 Please could you clarify Point 1 on your Mongolian Beef recipe it’s a little confusing. (ie how do I cut the steak). Thank you. The steak has fibers that run through it and you want to cut in the opposite direction those fibers are going (against the grain). I hope this helps. Great easy recipe. It came out wonderful! So glad you enjoyed the recipe, and thank you for coming back and leaving a review! This was so good! Very easy too. This will definitely be a regular for me. 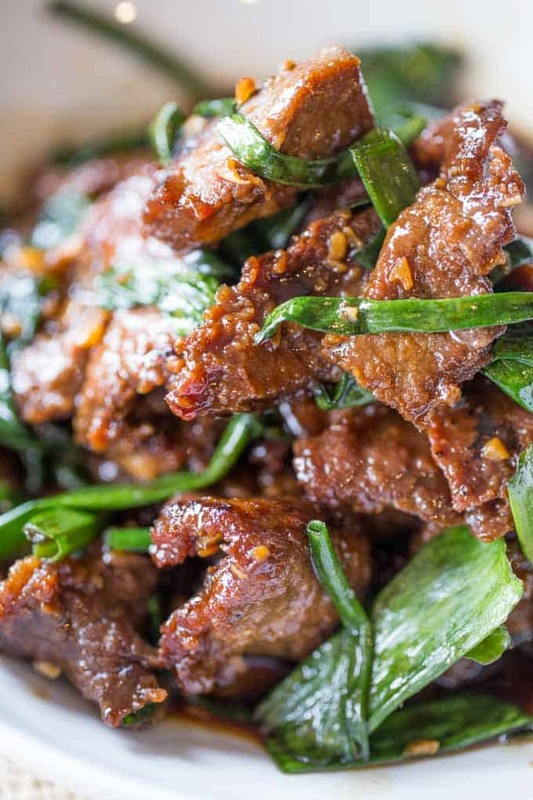 I am going to make this but use toasted sesame oil instead. What do you think? Yes, that would work too. Enjoy! I made this again! I had a vegetarian with us for dinner, so I substituted tofu for the meat (in small cubes) fried according to your directions with corn starch, and added seteamed broccoli, carrot, edamame and baby corn. Your sauce made the vegetables sing! Thank you again for this amazing and very versatile recipe! I made this last night. My grocery store doesn’t carry flank steak, so I used breakfast steak (a guy from the meat department said it was the closest thing). I also couldn’t find scallions. When it comes to home-cooking, I am no expert. I called my mom from the grocery store, who told me to buy some green onions. Even with my two HUGE substitutions, this recipe was a success! Thank you for helping people, like me, prepare quick and easy…delicious meals for our loved ones. Green onions and scallions are the same thing. You might also find things called spring onions, which are similar but different. The confusing bit is that this is U.S. terminology, and they can have different (even opposite) names elsewhere. This was delicious!! And amazingly all 3 of my kids thought so too! The sauce was amazing and crisping the beef was key. Also, popping the meat in the freezer for an hour or so helped heaps in slicing it. Great tip I saw here. I love when I hear the whole family enjoyed the recipe! I know how hard it can be to please everyone, especially kids! This dish is awesome! 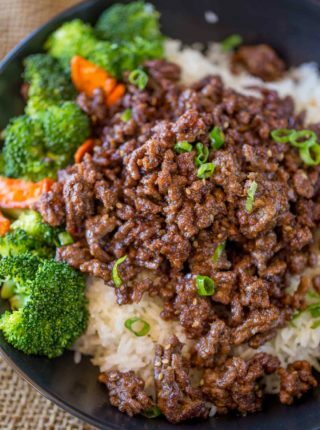 My modifications were only to add a bit of crunch and heat so I tripled the sauce, added carrot marchsticks, tiny broccoli florets, a few tsps of thai chili sauce and served over rice. TY Sabrina! Simple, easy recipe that was delicious! Thank you so much for sharing ?? I made this again, but used extra firm tofu, mushrooms and mixed veggies! I pressed the tofu and cut it into strips. Coated it with cornstarch and cooked it like it was meat. Followed all the other directions the same. It came out amazing!!! Thank you so much for this recipe!!! 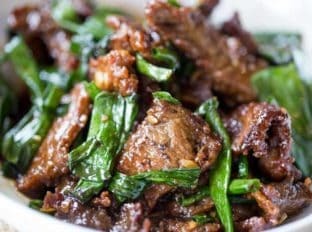 MONGOLIAN BEEF: for this recipe do you have to use low sodium soy sauce. i tried low sodium in other things and didn’t like the taste. i can’t wait to try this recipe sounds good.